Yikes. Unfortunately I’ve been tending to some of my fun real-life summer plans the past couple of days, and I have not gotten a chance to set aside as much time for writing as I would like. Usually, I try to have my posts on autoset weeks in advance, but for some reason, the “hole” for July 30th was left unplugged. And since I have been building some nice momentum in terms of page views lately, I wanted to put something out there today. I use Yahoo as my default homepage (it’s been that way for years), and they are currently running a daily series that profiles the stories of recent college grads with huge debt burdens. The fact that you are free from those kinds of shackles is a huge blessing, and I’m glad to hear that you are looking for ways to leverage your situation to make your future brighter. It’s hard for me to get into specifics because I don’t know your exact skills, your temperament, what brings you satisfaction, and so on. But hopefully, I’ll be able to say something of substance in spite of that. You mentioned in your comment stream that you have been buying BP. Since I’ve spent most of my year so far buying BP, I’ll use that as an example. Once I make the determination that a dividend is safe (or as safe as anything can be in this world), I move on to the next step, “For every dollar I don’t blow on booze, food, and women, I can translate that into $0.0491 in annual income.” For every $1,000 I can set aside in BP stock, I will have $12.27 mailed to me, put in my brokerage account, or transferred into my checking account every ninety days. (3) You can actually map out your path to financial independence. Let me go into more detail on that third element. Most people think of financial independence as reaching that million dollar mark or something to that effect. But here’s the truth: Provided you do not expect a significant increase in your expenses, you can retire the moment your passive income matches your current expenditures (although you may want your passive income to be a bit higher so that you can have a margin of safety). Here’s how I would measure the retirement journey: Let’s say you feel you can retire when you have $50,000 in annual income. This year, you invest $10,000 into BP. That gives you $491 in immediate income. Cool, you are 0.98% of the way towards being able to retire. At first, that sounds a little demoralizing, doesn’t it? But here is where things get fun. While you go on with life, maybe get married, maybe have kids, or whatever, those BP shares are still working hard for you. Let’s say the company raises its dividend by 8% next year. All of a sudden, instead of generating $491 in annual income, you are generating $530 in annual income. This is why people love dividend investing: The energy is all upfront, and you continue to reap the rewards of a $10,000 investment you made in your past. Just by staying alive for one year, BP now contributes 1.06% towards your target retirement income, instead of the 0.98% that we saw in the year before. 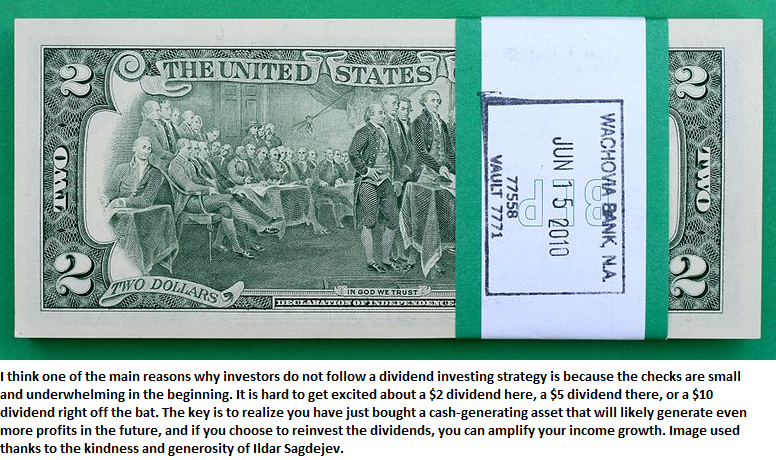 And don’t get me started on the sweet effects of dividend reinvestment! And that is just one investment. One company. One $10,000 outlay. Imagine if you spend your life planting trees like that across the 30-40 most dominant global companies dotting the multinational landscape today. Lil Wayne said, “Once you go black, you never go back.” Well, here’s the income investing version of that: “Once you go dividend growth, you never go back.” Drowning in income is fun. You can get creative and make your life a joy. The limits are your own imagination, and whatever gives you kicks in life. If I had to, I could come up with 90 different companies likely to have stable dividends for the next decade. Guess what, if you owned 90 companies, you’d get 360 dividend checks per year. Assuming you automated the process, you could effectively see money show up in your checking account every day if you felt inclined to set up your financial life that way. If someone had a $450,000 taxable portfolio that consisted of $5,000 positions in the 90 most dominant companies he could find in the world, he would effectively have roughly $43 deposited into his checking account every single day. Obviously in real life, some days would be lumpier than others, but if you wanted to, you could effectively structure your life so that every morning you woke up and logged into your checking account, you could see a fresh deposit of $43. At that point, provided the dividend is safe, who the hell cares if you are beating the market? You are making $1.79 literally every hour that you stay alive. You would get paid $14.32 while you sleep. By the way, I don’t mention these things to rag on indexing. John Bogle did a wonderful service for the retail investor, particularly if you find the process of stock selection intimidating and/or boring. And the statistics show that the average investor does not beat the S&P 500 index, which suggests the realistic possibility that you may have more total wealth if you adopt an index strategy than a stock picking strategy. Do I index? No. One thing I was fortunate to learn early on is that there are about 50 companies or so in the United States that do almost all of the heavy lifting. Seriously, show me a mainstream large-cap fund that holds no Procter & Gamble, Johnson & Johnson, Chevron, or Coca-Cola. I absolutely adore the Vanguard Wellington Fund. But when I look at their top ten holdings and see Exxon, Wells Fargo, IBM, Johnson & Johnson, and so on, I think: I can pick those companies myself! I also have some philosophical issues with indexing. First of all, when a company becomes more expensive, it consumes a larger portion of the index. If Exxon doubled in price in the next couple months, it would take up about 7% of the S&P 500 index. I don’t like that fact (as an aside: if you are wondering why the index still tends to beat most professional money managers in spite of this, it is due to (1) the fact that as companies fall apart, it becomes a smaller part of the index so you don’t have to deal with an idiot manager “doubling down”, and (2) it is able to capture things like Bank of America doubling in price from $6 to $13 in less than a year, which perhaps the individual investor might not). Long story short, what strategy would fit your long term objectives and match your temperament and skill set? Would you be pissed off owning dividend stocks that turned $10,000 into $350,000 total wealth if you later found out that you could have had $390,000 in total wealth if you owned a plain vanilla S&P 500 Index? Or do you get excited at the thought of finding companies with 3-4% starting dividend yields and 7-12% dividend growth rates? Do you enjoy watching things grow? Would a 34 year-old version of yourself enjoy thinking, “I remember when I was 24 and bought a 150 share block of Conoco stock. It paid me about $400 per year then, but thanks to dividend growth and dividend reinvestment, it now pays me $1,600 per year.” Would that kind of experience generate any sense of joy or happiness for you, or would you grow restless if you learned that maybe you could have had more wealth just by owning a plain vanilla S&P 500 Index fund? A lot of Seeking Alpha commentary just focuses on the ends. What strategy makes the most money. Personally, I like to focus on the process. If I assemble a badass list of 30 or so companies that grow their dividends by 8-12% annually, I figure I’ll be all right. Even if one company eliminates its dividend each year (something I’d consider very unlikely, considering the quality of the companies I typically focus on), I would only need a 3-4% dividend growth rate from the rest of the portfolio to make up the income lost. Tell me, how can you go wrong over the next 30+ years if you stuff your portfolio with Exxon, Chevron, Conoco, Shell, BP, Pepsi, Coca-Cola, Dr. Pepper, Southern Company, Aqua America, Kimberly Clark, Colgate Palmolive, Lockheed Martin, Microsoft, IBM, Emerson Electric, General Electric, Johnson & Johnson, Procter & Gamble, Nestle, Clorox, Wal-Mart, US Bancorp, Anheuser Busch, Diageo, Kraft, Abbott Labs, 3M, Aflac, Tiffany, Brown Forman, Visa, Pfizer, Mastercard, Kellogg, Boeing, American Express, Unilever, JP Morgan, Becton Dickinson, Hershey, Philip Morris International, AT&T, Disney, McDonalds, Church & Dwight, Realty Income, Campbell Soup, Wells Fargo, and General Mills? That’s my master list. I do not think it is an exaggeration to say that it would take WWIII or the collapse of the American Republic for that portfolio to fall through. Even in the latter case, you might still survive. McDonalds does something like a third of its business in certain European countries. If the United States collapsed, who do you think would be the owner of those European McDonalds? It’d be you the shareholder. Everything is so damn global now that the United States is more like a powerhouse custodian and wealth administrator rather than the canvas upon which all things must either succeed or fail. Here’s a trick: statistics about dividend companies are meaningless. You know why? Because they include trash companies that technically pay a dividend. Precision Castparts and its 0.06% dividend yield (which was at $0.12 annually from 2005-2012) will be included in any statistic that tells you about the long-term performance of dividend paying stocks, even though its dividend stays static for eight years at a time and the yield is a joke. Heck, Delta is now paying a $0.06 dividend. When that dividend inevitably gets cut sometime in the next ten years, someone might try to scare you out of dividend investing. Well, we all know airline dividends don’t work. The business model is trash, airlines get clobbered when oil prices rise substantially, and they are terrible places to be at the bottom of a business cycle (this is usually when the dividend gets cut). There’s fifty or so companies that run the world. If you want to own the same companies for the rest of your life, focus on them. It’s easy to see which companies run the world, and we are blessed to live in a time when it has never been easier (or cheaper) to become an owner. Read the book Private Empire. It will explain to you how Exxon wields more power on K Street (the place where the Washington DC lobbyists are stationed) than any other entity in the world. Exxon donates to every politician, until you piss Exxon off, and then they actively campaign against you. Do you think Exxon is going to get what it wants or not? In oil rich third world countries, Exxon wields more power than the US embassy. That is not hyperbole on my part. I do not think the average American spends time thinking about the power being wielded by a company that generates $36 billion in profits per year across 48 different countries. But here is the crazy part: You can become an owner in Exxon for free! $0. You can have $50, $100, or whatever amount of money you desire taken out of your checking account and used to buy shares of Exxon. How cool is that? The path to wealth has never been easier. You can acquire more and more shares of the most powerful company in the world each month. The choice is up to you. Imagine if you spend your life trying to accumulate 30 different kinds of “Exxons” to stash into your portfolio. One of the best things to remember in life is that there is two sides to everything. I’m told that Irishmen are good at holding a grudge. The flip side of that is that they are good at being a loyal friend. You hear certain politicians complain about the omnipotent power of the oil companies. The other side of that equation is one word from the investor’s perspective: “moat”. Does any of the stuff I have just written excite you? If so, you might want to pick individual companies. If I bored you to death halfway through and you stopped reading, you might prefer indexing. Either way, if you can generate $10 in wealth for every word in my response, you should end up a rich man.